iMovR Standing Desk Foot Rest is a simple yet versatile product that you can use with both a traditional desk and a height-adjustable desk. Its four tilt angles accommodate a wide range of user heights while an anti-fatigue rubber topsheet makes for a nice grippy surface even for your dress shoes. Lightweight. Four angles make it highly adjustable. Anti-fatigue rubber surface. Less elegant than some more expensive foot rests. The iMovR Standing Desk Foot Rest is simple yet highly functional. It may not win any beauty pageants in its category, but it’ll give you bang for your buck with its four tilt angles, anti-fatigue rubber surface, and light weight. 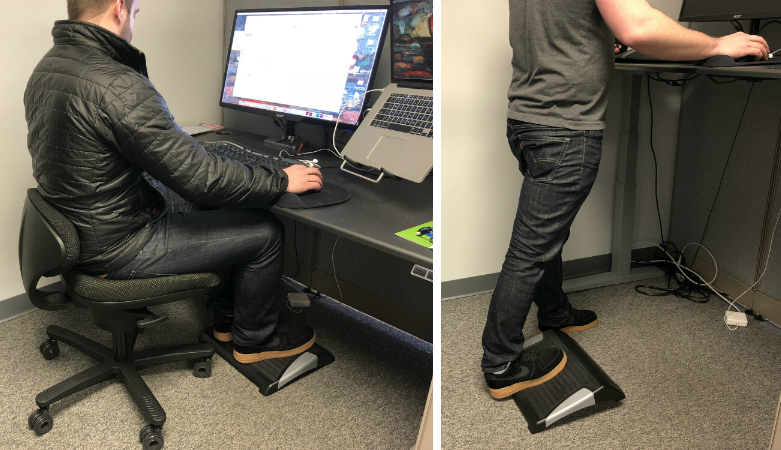 Place it under your traditional sitting desk for improved blood circulation, or use it at your standing desk to distribute your weight more evenly, stretch your calves, and reduce fatigue and joint stiffness. 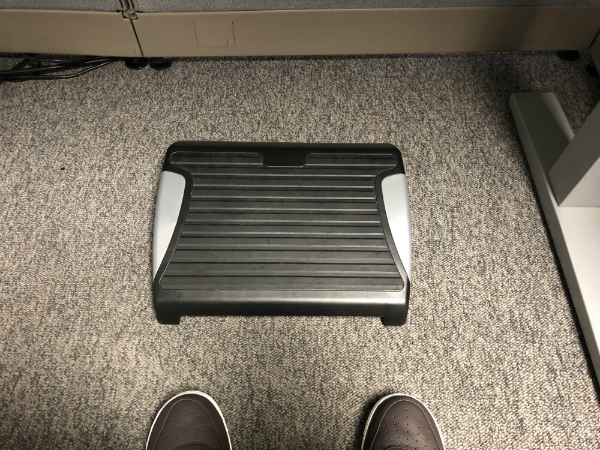 Footrests are making a splash in the office fitness market as more and more brands realize their benefits, especially when paired with a standing desk. iMovR is among the latest brands to roll out an affordable sit-stand footrest option designed to accommodate users of various heights. The simple two-toned plastic platform has plenty of surface space for both tall and petite individuals, and unlike many other solidly-constructed footrests, it features an anti-fatigue surface made of rubber. You may not be struck by its looks the moment you open the box, but after using the product for awhile, you’ll definitely appreciate its lightweight and clever design that make it both affordable and highly adjustable. The first thing you’ll notice after opening the box is that the base folds and unfolds to achieve different levels of tilt, which, in addition to providing multiple angles for your feet to rest, also makes the device incredibly portable. Grippy, anti-fatigue rubber material covers the center of the platform. 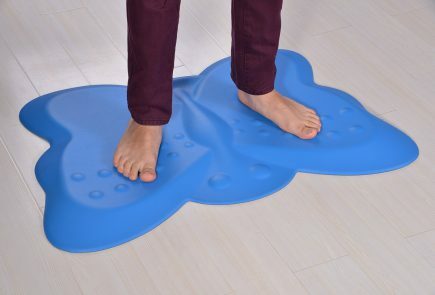 While not meant to replace an anti-fatigue mat, this rubber surface works well to cushion your soles when sitting or standing, and its grippiness will your dress shoes from sliding on slippery laminate floors. As you plant your feet on the 15.7" x 10” platform, you should feel some relief in your lower back, as the weight of your feet stops pulling your lumbar spine muscles (this happens if your chair is too tall for you and your feet aren’t planted firmly on the floor). Lumbar support instantly makes for better posture, and with four adjustable height options and tilt angles, you can create a more ergonomic sitting position for your workstation. Here is a tip: If you find yourself hunching forward, push the footrest deeper into your desk. Furthermore, recline in your chair to open up your hips and form an angle between 105 and 135 degrees (recommended over the traditional 90 degrees by recent research studies). The footrest moves easily around the floor, so you won’t have any problem adjusting it with your feet. If slipping is an issue, you can place it on top of your anti-fatigue mat. Its grippy surface will keep the footrest in one spot. To adjust the height and tilt angle, you have to pick up the footrest, but you’ll probably end up finding a favorite setting that works best for your usual seated position. That being said, we suggest you experiment with unfolding the legs to accommodate different sitting positions. There is more than one healthy way to sit. If you like sitting upright, put the footrest closer to your chair base and reset your backrest adjustment. You should find your back resting against the backrest with your feet planted comfortably on the slanted footrest. Though there’s plenty of real estate for your feet, you won’t be able to move inside this position much, so periodically we recommend switching it up to standing or walking. A reclining seated position is better for your back, but since it’s more relaxing, it’s better suited for tasks that require less focus, like consuming content, talking on the phone, or listening in on conference calls. We found using the footrest in the standing position can relieve pressure on your supporting leg (the one you lean on and shift most of your bodyweight to) and can provide an opportune time to stretch your calves. If you use the footrest for calf stretching, the best position is where the base is tilted up to the highest degree. Although it’s not visible under the desk, you want your footrest to keep its polished look and be easy to clean. We found iMovR’s footrest to be easily washable with warm water and cloth or dish soap if you prefer. 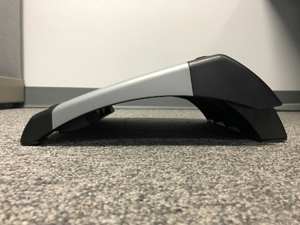 iMovR’s Standing Desk Foot Rest is a great option for those who are looking for a simple yet versatile and affordable sitting/standing footrest that does what it advertises—provides comfort regardless of your chair setup and helps distribute your bodyweight more evenly while you’re standing. Its folding design and light weight make it incredibly portable, and its spacious surface allows both tall and short users to reap health benefits such as improved circulation from opened hip angles, and weight support regardless of your position. To see how iMovR's foot rest stacks against competition, check out our footrest comparison review. If you're looking for something more active, we recommend looking into balance boards or active mats. Choose an anti-fatigue mat if you're looking for more comfort in standing. 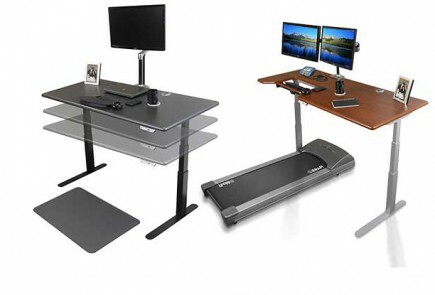 And if you want to stay up to date with all the newest office fitness products subscribe to our newsletter. Dimensions: 15.7" x 10” x 3.3"; 3.5"; 4.8"; 5.1"